Hasta luego, Buenos Aires …. It’s sad but we’ve only got a couple of days left, then on to Sydney and the following day Perth. Now what have you missed? 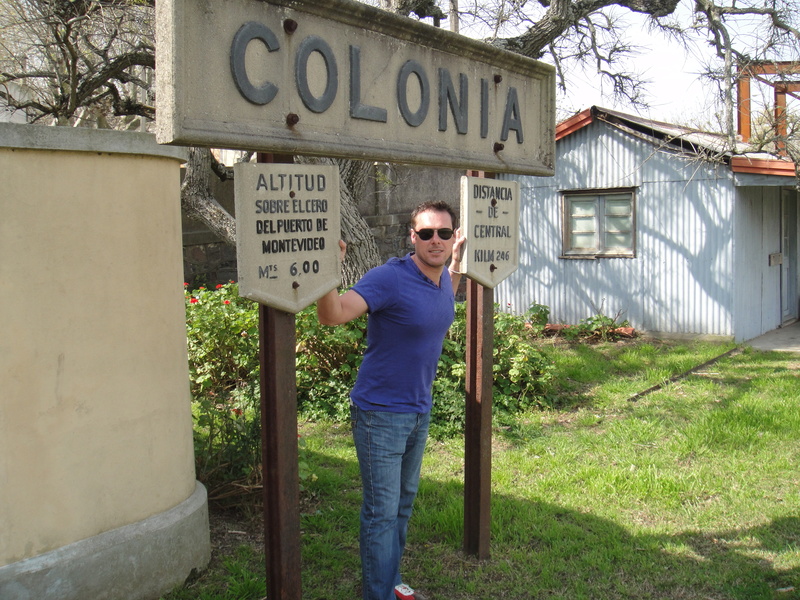 We took a day trip to Uruguay, to a place called Colonia del Sacramento. Mike and I took a ferry ride (we were both sure it was one of the old Rottnest ferries) across the very brown and murky Rio de la Plata that separates Argentina and Uruguay. Colonia del Sacramento is a historic Portuguese-Spanish-English outpost on a promontory sticking into the river. A very quiet and beautifully historic town to wander around, before a long lunch looking over the river. That was our culture for the day, I dragged Mike around one-too-many museums, and I have now hit my art gallery quota for this trip (every one which he loved). On Saturday we visited La Boca, the original port of BA, a tourist precinct of three blocks surrounded by a suburb that every guide book we have warns us not to wander around, even during the daylight hours. La Boca has a football team that is known for Maradona and the most one-eyed and sometimes violent supporters. Makes Collingwood cheer squad look like a primary school sports carnival. So very unwisely we walked from our Barrio down the most busy streets we could find to the tourist area. The living conditions looked like they hadn’t changed since the city was settled. We survived the walk, and enjoyed another parilla (BBQ) in what appeared to be someone’s backyard with a local musician; it was beautiful, sunny and filled with families. Sunday we lucked out again and went to a local fair, Feria de Mataderos. 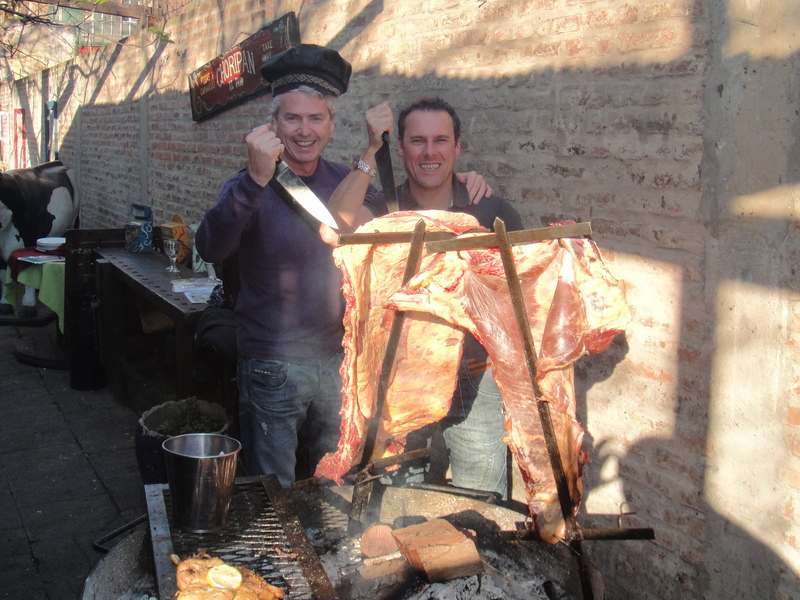 It was a fair day for the portenos (locals) and gauchos (cowboys), set way out in the suburbs of Buenos Aires so on the taxi ride there, we just kept hoping that we would be able to get a taxi back! 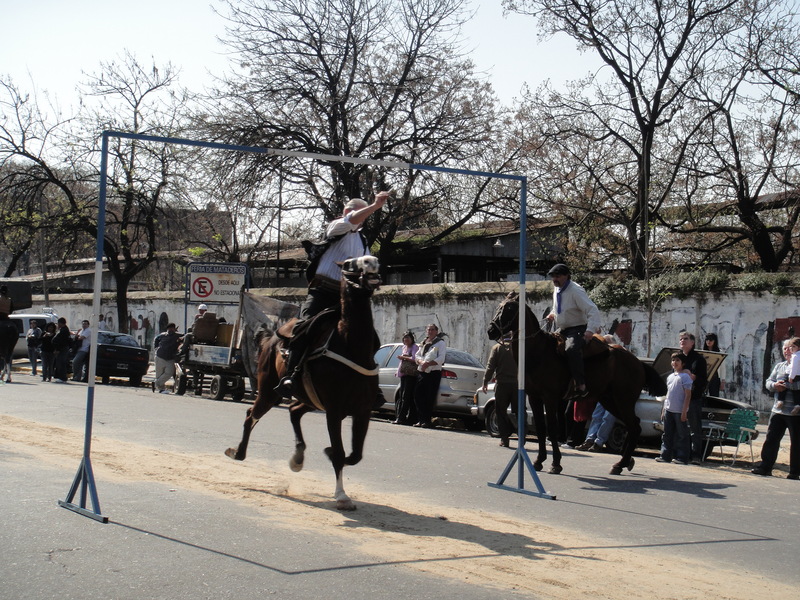 It was set on a street that was closed off, and a mixture of local produce/handicrafts, parilla, horse events and impromptu Tango and folk dancing. The horse events were amazing: imagine a high jump frame with a ring the size of a keyring hanging off a piece of ribbon from the cross bar. The gaucho then with a small spike clenched between his fingers gallops down the road and tries to remove the ring as he passes under it, using the spike. I didn’t see any gauchos wearing glasses, you definitely need twenty/twenty vision. The gauchos don’t quite dress like ‘Man from Snowy River’, more MC Hammer/ harem pants with a beret and cravat. A couple of nights ago we had dinner at a restaurant where the chef was trained at El Bulli, that amazing restaurant in Spain. We’ve read about it, but it’s more for people on a Rothschild budget than our Burger King budget. So we thought we would try the BA version, lots cheaper. The food is very experimental and artistic, deep fried fish skin in frothed soya sauce with breaded yaks testicle (I made that bit up – Mike wouldn’t have eaten if it was breaded…!) but you get the idea. 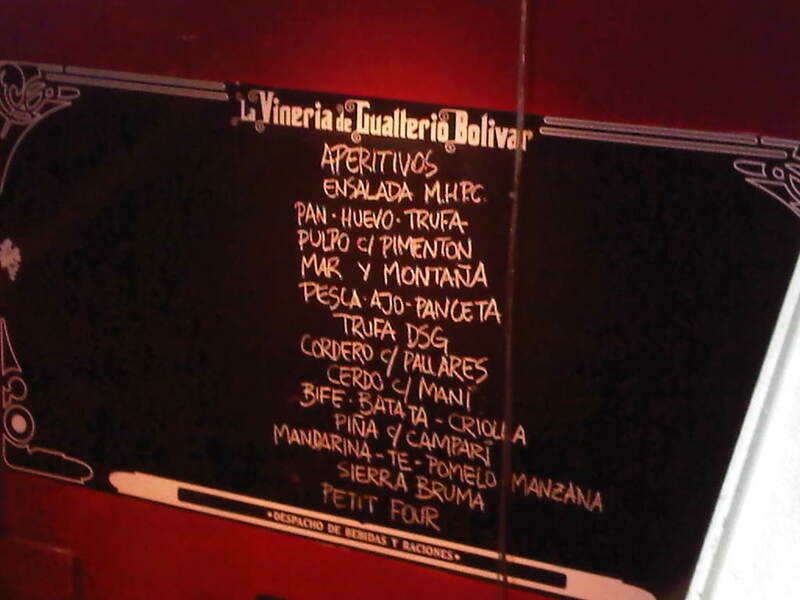 A degustation menu of 16 courses, it was amazing and a challenge/pleasure to the taste buds. 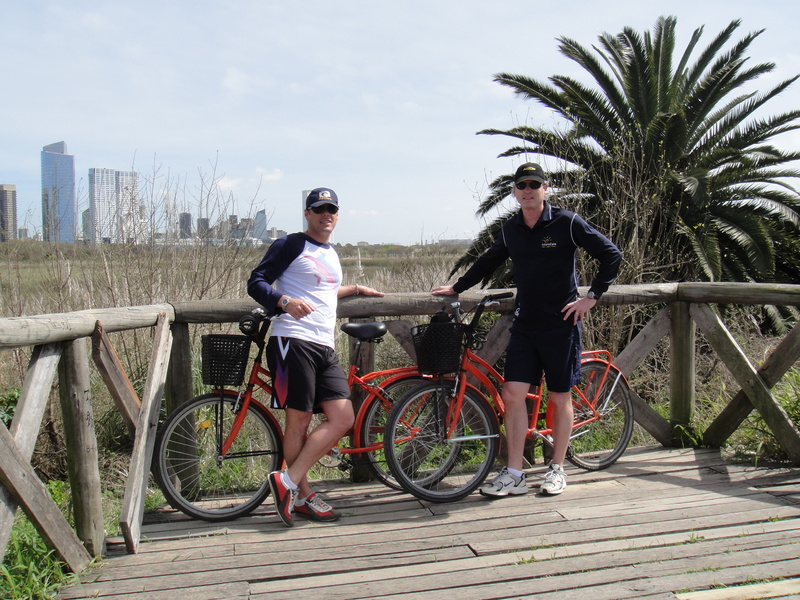 Today Mike and I hit the bikes and toured the local ecological park that borders the city and the river, a mixture of lagoons and pampas grass. Not quite the bike that Mike is used to, with our bright orange bikes and basket we could have been Mary Poppins, just missing the parasol. We had our first wild animal experience, you could say a Steve Irwin moment. Fortunately we were close, but not too close. It was a flash of fur and fangs as it crossed the path in front of us. Some of you may not know the Guinea Pig is a native of South America. So this afternoon we sit in a cafe with WiFi, over a local Chardonnay discussing where to spend our last day. I didn’t mention we missed Iguazu Falls, we left it too late, and the weather was not ideal (thunderstorms). We have an excuse to return. We’ve fallen in love with Buenos Aires and want to explore Uruguay, Chile, Peru. Life is too short and there is so much to see (sorry about that last bit, probably the Chardonnay talking). See you soon, over a Chardonnay.